We power up our Sega Master System and take a look at the built-in games that become available if you don’t put a cartridge in. We get a couple of deliveries from Japan and then open them up. We turned the camera on in case someone wanted to watch that. We got more stuff from Japan, 1 of 3 packages of various retro gaming goodness. Another delivery of retro goodness from Japanese auctions. Just a small box really but full of PC Engine games and with a little bit of variety thrown in. The development of the Saturn was tumultuous. Sega had tried to extend the life time of the Megadrive for as long as possible by adding new peripherals such as the Mega CD and 32X. But this had caused confusion amongst the consumers and they started to panic. The Saturn itself had gone through numerous design changes, initially it had been designed as a 2D machine, Sega hadn’t expected 3D to be a key selling point, considering it was barely taking off in the PC world. But Sony had made it a key feature of the upcoming Playstation and whilst Sega didn’t consider Sony to be their primary competitor enough buzz in the media finally got though to the heads in Sega Japan to make them realise they had to react. The redesigned Saturn was based on Sega’s existing Model 1 architecture, itself a groundbreaking 3D arcade system. The architecture used the SH2 RISC Processor, a custom chip designed by Sega and Hitachi. Whilst not a GPU in the sense we know it now, the chips made certain calculations faster. For 3D to work it needed two of these chips and therefore so did the Saturn. After Sony released the specs of the upcoming Playstation Sega were forced to add another chip, the VDP, to compete. Whilst this was happening Sega of America were trying to draft their own system, this would use a custom chip created by SGI. But Sega of Japan were uninterested in changing their plans and were largely dismissive of the team SGI sent to talk to them. This cold-shoulder approach caused SGI to end their talks and they instead sold the solution to Nintendo and it became the basis of the Nintendo 64‘s Reality Processor. In the end the Saturn became an 8 chip megalith. The complexity was astounding and Sega were struggling to work with it internally just to create the tools that developers would need to make games. At this point Sega decided to make the 32X add-on for the Megadrive. This had some elements from the Saturn, including the Hitachi SH2’s. But it would not be compatible with Saturn software and consumers were confused by the mixed messages they were getting. The Saturn released in Japan to fairly positive sales. Virtua Fighter pretty much sold the system and almost everyone buying a console bought it. But in a move that would haunt Sega until they left the console market, they announced the North American release date of Saturday the 2nd of September 1995. Nicknamed Saturnday this day was chosen to give western developers time to get to grips with the complex system and for retailers to prepare for stock. But then, at the E3 event in May the head of Sega of America, Tom Kalinske, announced that the console would release immediately at a price of $399. Even worse only a few retailers had stock, the rest would miss out of the traditionally high demand first day. This news upset publishers and retailers. The publishers had to rush development of their titles to get them ready, and most would miss release day by weeks. The retailers who had not received stock were outraged, some announcing that they would never stock a Sega item ever again. This was an almost perfect outcome for Sony, who were not frightened into moving their release date earlier, instead the head of Sony US came out and said one thing, $299, the price of the Playstation, before leaving the stage to universal applause. Once developers had got used to the Saturn hardware they found out it was a powerful beast, but it was missing a few things that the Playstation had. But it also didn’t suffer from the texture warping effect that Sony’s machine did. The Saturn wasn’t a flop, as such. It sold well enough, but it caused tremors in the industry that Sega never recovered from and had a large impact on the failure of their next system, the Dreamcast. There are two conflicting accounts to how the date move happened, Sega of America said they were unaware of the date change until the day of the conference when Sega of Japan ordered them to announce it. Sega of Japan say that SOA were well aware beforehand and were involved in the decision. We may never know the absolute truth, but the fact remains that 3 retailers already had stock and an agreement to sell them the same day, that was not something that Sega of Japan could arrange and was definitely not something that could be arranged in a couple of hours. Sega knew they had to try harder to beat Nintendo in the next generation, part of which was getting out first. To this end they took their System 16 arcade board, home to such classics as Altered Beast, and made a living room friendly version. The Megadrive was born, it sold well in Japan eventually, but the launch was disrupted slightly by the release of Mario Bros. 3 on the Famicom a week before. Positive reviews helped build sales but they still only sold 400,000 units in the first year. They needed to go international quickly, after two mis-steps, a deal with Tonka toys and a deal with Atari, they opened a North American office and hired a staff. Unfortunately, due to a trademark dispute the Megadrive had to be renamed to Genesis in North America. The Sega America team wasted no time and got some hard hitting adverts out. The Megadrive sold well, it was eventually overtaken by the Super Nintendo, but it’s sales were easily strong enough for Sega to consider it a success. Sega attempted to prolong the life of the Megadrive by adding a number of peripherals. The first, the Mega CD, added CD capabilities to the Megadrive. It was a nominal success, but the need for a separate power supply made for a messy living room though. The next add-on was far less successful. Because Sega were still developing their next console they were keen to string the Megadrive along even more. They introduced the 32X, a device that added a new set of processors to the Megadrive that could be used alongside the existing hardware. It was expensive and added yet another power supply. Owners of the console weren’t sold and only a few games were made. But the introduction caused a lot of confusion and caused Sega to rush the introduction of the Saturn. There were numerous versions of the console. A compact version was released with slightly cost reduced components. This also had a revised version of the MegaCD which sat next to it instead of on top. TecToy are still creating versions of the Megadrive and games for the Brazilian market. 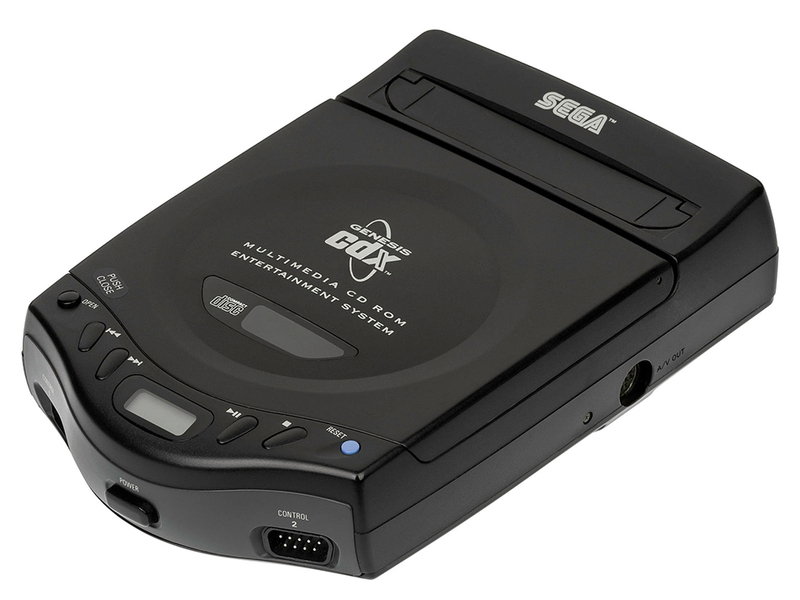 Sega released a combined Megadrive and MegaCD called the CDX, which could also be used as a portable CD Players. Victor released a combined Megadrive and MegaCD in Japan called the Wondermega. JVC released a restyled version called the X’eye in North America. Neither were popular. Amstrad released a combined PC and Megadrive for the European market, called the Mega PC. It was similar to Sega’s own Terradrive, but considered better built. Pioneer released a MegaDrive module for it’s LaserActive laser disc player. The Saturn had caused Sega a lot of issues. Not only was it largely a flop, being massively outsold by the Playstation and beaten by Nintendo. But it also caused Sega numerous issues with publishers, distributors and retailers. Several large retailers in North America, upset at being missed out of the Saturn launch, refused to carry Sega products, and that refusal carried on through the Dreamcast. Although most publishers eventually did produce games for the Dreamcast, one especially damaging holdout was Electronic Arts. Whilst they weren’t quite the size they are today, they were still an important figure with a lot of popular IP. Most importantly for the North American market their sports licenses that had proved very popular in the previous generation. Initial sales of the Dreamcast were strong though, helped by some solid arcade conversions from Sega and their partners. Indeed it was considered to be one of the strongest launches in software terms up to that point. The sales continued strong up until the Playstation 2 was announced. As soon as Sony gave a launch date the Dreamcast sales started to dry up. They did get a minor boost when Sony were unable to meet demand, but not enough for Sega to continue. To add to their problems a flaw was found in their copy protection system, a routine created to cope with a special form of Japanese disc allowed discs to be created on normal CDs that bypassed region and copy checks. This was the final nail in the coffin, Sega reduced the price of the Dreamcast to sell the back stock. Once it was gone, they removed the Dreamcast from sale and left the console world for good. The Dreamcast was certainly a powerful console, easily able to match the Playstation 2. A lot of this was due to the custom PowerVR GPU created by Imagination Technologies. It was designed to pair with the SH4 processor perfectly and that meant there was very little bottleneck in the system. Online play was a feature built-in to the console. All consoles came with a dial-up modem, but a broadband option was also available. Notably it was the first time that Quake had online play outside of the PC. Sega produced a unique memory card system called Visual Memory Units. These memory cards had little screens that games could use to display information and even install mini games onto. Unfortunately, this also meant the VMUs cost quite a bit more than other consoles memory cards.